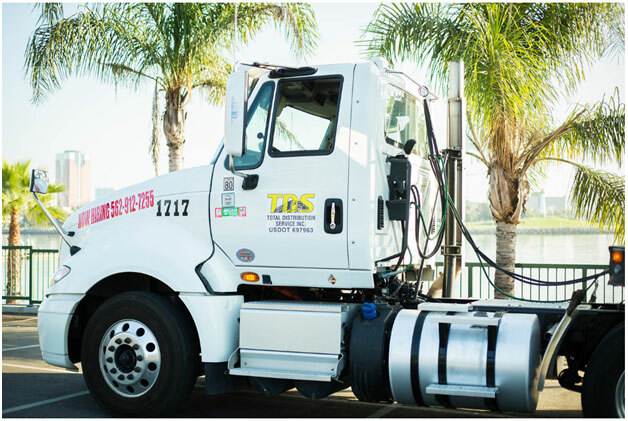 Total Distribution Service, Inc. (TDS) is a diverse Trucking Company based in Wilmington and Long Beach, California that specializes in Intermodal Drayage, Trans-loading and Warehousing of palletized and loose cargo. At TDS, we understand this complex transportation market and how competitive it is among the carriers. Therefore, the management team and staff realize that our customer service must be the best in the industry, and more importantly it must go beyond our customer’s expectations. We hire only safe, professional and courteous drivers that end up being with TDS throughout their driving careers. All of our drivers are tracked via GPS, and are managed using a state-of-the-art intermodal drayage program. All of our trucks are Port approved and Eco Friendly. As of September 13, 2011, we have achieved the highest eco-friendly score among all SmartWay partners. Go Green!!!! Fully staffed day and night to take care of all your Drayage needs. Totally secure Terminals with 2 transload facilities, 1 of which is within the Overweight Corridor. Our drayage system is able to create reports specific to your needs. Anything from EDI Appointment LFD or any holds. We customize our customer service to fit your needs, Continual update and daily reports so you can stay informed during every move. We have over 80yrs of Drayage experience in our management staff alone! Unquestioned honesty and Integrity are the foundations of TDS. Open and honest communication so you never have to wonder. All drivers are dispatched from our system to their tablets so we can provide POD's upon delivery.